LEAF-BOA – GO GREEN LISBOA! This figure is more than enough for one contact per hotel or other lodging, and means that there is flexibility in the workload taken on by members of the team. Once we reach 6,100€ through crowd funding (the equivalent of 1€ = 1 lodging) we can start on the initiative. Fire doors in hotels do not need to be ugly anymore! Finally architects do not have to contend with unsightly sliding/folding fire doors to protect public spaces in hotels. The first world’s fire protection closure has been designed without side guides and won the AIT Innovation Award for Architecture 2011. Check out this simple, elegant method of creating full fire protection by letting hanging fire curtains wrap around either side of the opening, heavily resting on the floor thus not allowing any smoke or flame through from adjacent spaces. When not in use, the lower section of the structure serves as a closing seamless plate, tight-fitting and flat against the false ceiling. We’ve got videos showing the door in action in English, Spanish and French. Click on the respective country’s flags to watch! We believe that economic growth and social welfare are inescapably tied to the well-being of the environment.We therefore accept our responsibility in caring for the environment and we commit ourselves to developing and integrating good practices and sustainability principles in our business strategy. We recognise that both we ourselves and the community of which we are a part are only just taking the first steps on the path. Many changes will have to be made if we are to reach our basic aims. We believe, however, that our efforts to support and develop a wholesome environment will be the guarantee of continuity for present and future generations. Any hotel that expresses concern for the environmental impact of their activity and is ready to start with a more environmentally friendly policy can receive its first leaf in the Five-Leaf System. One of the ways that hotels have if they wish to extend this philosopy is through the choice of products and services that already follow the principles underlying the system. The award of the EU eco-label aims to highlight ecological products where the manufacturer is showing respect for the environment. Joining the scheme is voluntary and there are minimal costs involved in assessing the production processes involved and in maintaining the level needed for the award. 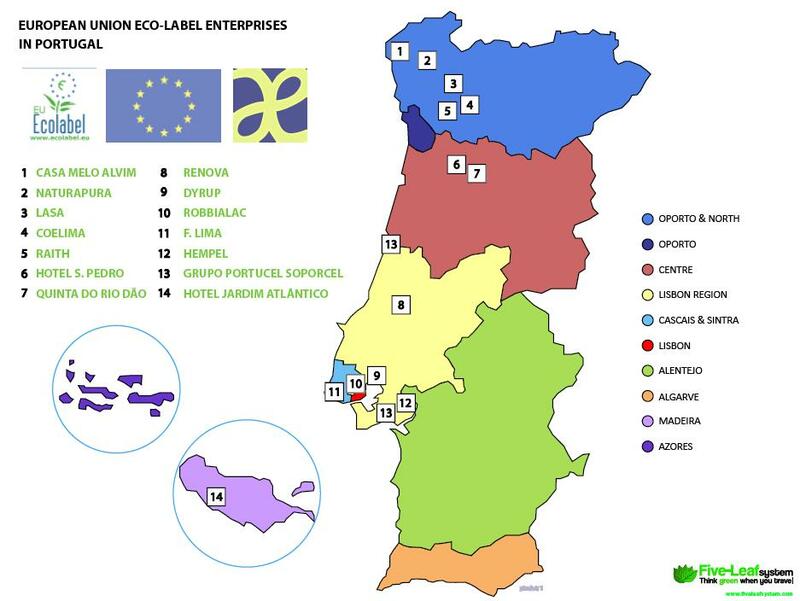 The Portuguese Ministry for the Economy is a member of the EU Eco-label committee (CREUE), which defines the ecological criteria underpinning the award of the Eco-label. The criteria that are used have been chosen as a result of a wide-ranging battery of scientific studies. Hotels can choose from a dozen of distinct products groups – and as the process is dynamic there are new awards every month! Just look for the symbol of the daisy! The system is pan-European, voluntary, selective, and transparent. The procedures are officially recognised and based on an array of criteria, with an independent award process. The award gives the right to display a special logo. The demand for ecological products provides a major spur for companies to reflect on ways to make their products more ecological, to bolster their pro-environment policies and enhance the performance of their products and services throughout their life cycle. The Eco-label system provides the ideal way of reaching this goal. It was created in 1992 (and amended in 2000 through Regulation (CE) 1980 and in 2010 through Regulation (CE) 66 of the European Parliament and the Council). The system encourages manufacturers to create environmentally friendly products and covers services and goods for everyday consumption. soil pollution, There are also criteria relating to performance. These criteria, following adoption by a majority of the member states and by the European Commission, are valid for between two and five years. They are then reviewed and may be strengthened with a view to improving the environmental performance of products that display the Eco-label. Our environmental policy is influenced by an awareness that our hotel and its business can only be sustainable if we consider the added value brought by the wealth of nature that surrounds us and an understanding of the natural resources that we use. We believe that it is essential, and extremely beneficial for our business, if we can play our part (at our level) in raising awareness for the environment among our stakeholders. We recognize that we are just taking the first steps, but our aim is simple: to do our best! The São Félix Hotel was awarded a three-leaf classification, and is the perfect example of the kind of hotel management approach that we would like to welcome into the Five-Leaf System from hotels in any part of the country. Five-Leaf is a dynamic system, allowing hotels to grow in sustainable fashion at their own pace over the years until they reach the Five-Leaf standard. The Hotel Jardim Atlântico was the first hotel to come into the Five-Leaf System with a section of its site totally dedicated to environmental issues. It has been concerned with the environment for almost 20 years, and a decade ago became the first hotel in Madeira – and the second in Portugal – to be awarded the Certificate NE EN ISSO 14001 (the international certificate for environmental management in the sector of lodging and restaurant services). It also holds a number of other awards and distinctions, among them that of “Best Ecological Hotel” amaong 600 hotels in Europe (2008/2009); in 2008 it was nominated for the “Ecothrophea” prize awarded by DRV-Deutscher ReiseVerband, and in 2008 was the winner in 2009; it won second prize in the award by Thomas Cook (2008/2009); in an unbroken stretch from 1997 through to 2009 it was awarded the “Umweltchampion” prize by TUI, the world’s leading tour operator; from 2002 to 2007 it won the “Environmental Hotel Award” of the Swiss operator HotelPlan; it was awarded the distinction of “Amigo do Ambiente – Excelência” by the Madeira DRTT in 2006; for three years running (’97 to ‘99) it was recognized by the GREEN GLOBE 21 (WTTC) with Distinction and Commendation Awards and the Achievement Certificate and by the International Hotel Association together with The International Hotels Environment Initiative it was awarded the distinction of “Green Hotelier”. In 2011, it was the first hotel in Madeira to be awarded the five-leaf classification in the Five-Leaf System. The Convento do Espinheiro is not only interested in the well-being of its guests and their exigencies, it is also concerned about the sustainability of the environment of which it is a part. The hotel would like to leave a really long-lasting legacy behind it. When the Hieronymite monks lived here in the 15th century, the monastery was totally self-sufficient. The Convento do Espinheiro is a Luxury Collection Hotel & Spa, and one of its concerns now is to make the monastery vegetable and fruit garden productive again. The plants and herbs that have been sown conform to the demands of biological agriculture, and this means that no chemicals have been used. These are the herbs that give such a flavour to the delicious meals served in our restaurant, Divinus. All organic waste from the kitchen, along with fallen leaves and grass cuttings are put in compost tanks to be used later as fertilizer for our gardens. Following the renovation of the old aquaduct, it has been possible to start using water from the well to irrigate the gardens and they are now self sufficient in water. This in itself is a real blessing, in a region where the average annual rainfall is around 700 mm. This policy has also been applied in our garden, where we have replaced some of the plants with Mediterranean flora requiring less water. The Convento do Espinheiro has adopted other policies too with the environment in mind. Among these are the use of eco-friendly lighting, solar panels for heating water and regular dissemination of information to stakeholders regarding our environmental practices.